Programmers run into parsing problems all the time. 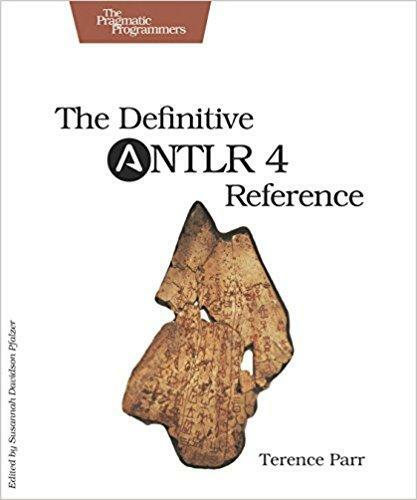 Whether it's a data format like JSON, a network protocol like SMTP, a server configuration file for Apache, a PostScript/PDF file, or a simple spreadsheet macro language--ANTLR v4 and this book will demystify the process. ANTLR v4 has been rewritten from scratch to make it easier than ever to build parsers and the language applications built on top. 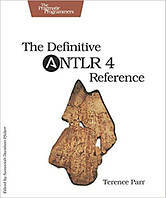 This completely rewritten new edition of the bestselling Definitive ANTLR Reference shows you how to take advantage of these new features.Build your own languages with ANTLR v4, using ANTLR's new advanced parsing technology. In this book, you'll learn how ANTLR automatically builds a data structure representing the input (parse tree) and generates code that can walk the tree (visitor). You can use that combination to implement data readers, language interpreters, and translators. You'll start by learning how to identify grammar patterns in language reference manuals and then slowly start building increasingly complex grammars. Next, you'll build applications based upon those grammars by walking the automatically generated parse trees. Then you'll tackle some nasty language problems by parsing files containing more than one language (such as XML, Java, and Javadoc). You'll also see how to take absolute control over parsing by embedding Java actions into the grammar. You'll learn directly from well-known parsing expert Terence Parr, the ANTLR creator and project lead. You'll master ANTLR grammar construction and learn how to build language tools using the built-in parse tree visitor mechanism. The book teaches using real-world examples and shows you how to use ANTLR to build such things as a data file reader, a JSON to XML translator, an R parser, and a Java class->interface extractor. This book is your ticket to becoming a parsing guru!